Thousands of years ago, Hippocrates, the founder of western medicine, said, "Let food be thy medicine." Tragically, the way most Americans eat, food is more like poison, making us sick and killing us prematurely. Heart disease and cancer are the nation's top killers, and the risks of both can be reduced by eating plants instead of animal products. Removing meat, milk and eggs from the menu also prevents animal suffering and goes a long way toward lightening our environmental footprint. People are finally recognizing the profound impacts of their food choices, and we are now in the midst of a burgeoning food movement. We read about it daily -- more and more people are eating local and organic, going vegetarian and even vegan. I want to see it for myself, so on May 14th I'm heading out on a three week, cross-country adventure to explore "vegan America." It's called the Just Eats Tour and you can follow along daily here. The Just Eats Tour is part of Farm Sanctuary's 25th anniversary. We were founded in 1986 to combat the abuses of factory farming and to promote plant based eating. 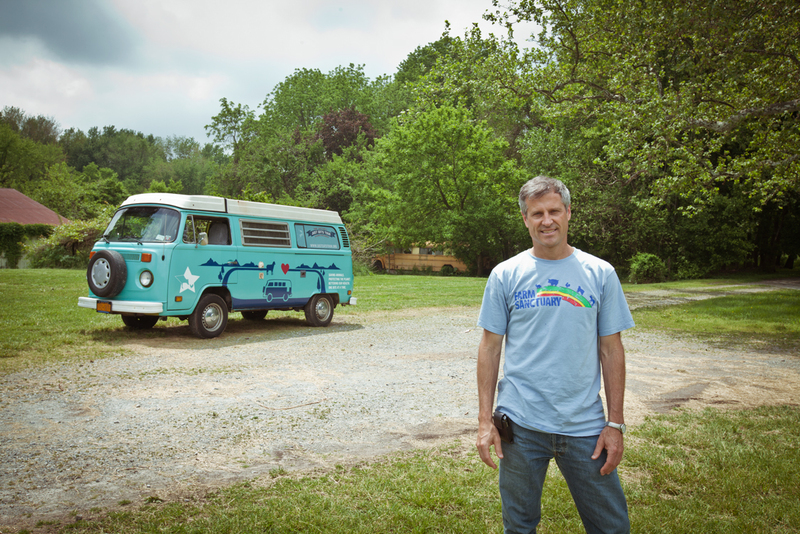 In the early years, we funded the organization by selling veggie hot dogs out of an old VW van at Grateful Dead concerts. Farm Sanctuary is now America's leading farm animal protection organization, supported by more than 230,000 citizens across the United States. We work to educate people about the animal cruelty and other abuses of factory farming, and believe that most people, when provided with information, will make healthier, more humane and environmentally sustainable choices. We also advocate for legal reforms, and although the laws are still grossly inadequate, we have been able to pass groundbreaking legislation to lessen the suffering of animals exploited by the food industry. And, we operate sanctuaries in New York and California where we care for nearly 1,000 chickens, turkeys, pigs, cows and other rescued farm animals. Once they come to Farm Sanctuary, the animals are treated like our friends, not our food. We encourage people to consider adopting vegan lifestyles, and we disseminate information like this fun video we recently released to expose the environmental impacts of animal agriculture. I've been vegan since 1985, and it is great to see a growing interest in this lifestyle, especially in the past couple of years. People are coming to it for diverse reasons -- health, spirituality, a desire to live gently on the earth or to prevent animal suffering. Among those who have moved toward eating plants instead of animals are: Bill Clinton, Natalie Portman, Woody Harrelson, Mike Tyson, Lea Michelle, Steve Wynn, Mary Tyler Moore, Alicia Silverstone, Russell Simmons, Ellen DeGeneres, Jesse Eisenberg, Biz Stone, John Mackey, and Prince Fielder. Vegans still comprise a small percentage of the U.S. population, but our numbers are growing. The Just Eats Tour began at a black tie gala in New York City at Cipriani's on Wall Street on May 14th and three weeks later we arrived at Farm Sanctuary's shelter in Orland, California for our annual Hoe Down on June 4th. Along the way, we visited big cities and rural communities. We spoke with chefs, business owners, entrepreneurs, fitness experts, celebrities and everyday heroes who are exploring vegan living. We posted recipes, videos, photos and other resources. We also want you to share your recipes on our website, and we encourage you to take the Vegan Challenge. We hope this tour will help Americans better recognize the impacts of their food choices, learn about positive alternatives, and ultimately, choose healthier, more humane and sustainable options. For a recap on Gene's cross-country trip please visit www.justeatstour.org. Celebrate Farm Sanctuary's 25th Anniversary and explore Vegan America with the Just Eats Tour! Cipriani and Field Roast came together for the very first time to create an amazing gourmet, vegan feast.